Been babbling about expat life since 2004. Ever since, I moved to Israel, found work, finished an MA, married, settled the 'burbs, had 2 babies. This is where I take notes on life as a US expat in Israel. Isn't that what it's all about? 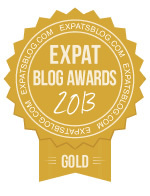 ExpatsBlog.com Expat Blog Awards 2013: Israel Gold Award! This blog won the Gold Award for best expat blog in Israel! i go to lizrael update daily to see what "lizrael" has to share. she is so full of knowledge and caring. "lizrael" continues to inspire and shares about her family, friends and life that you just want to know more about this expat and her day to day experiences in israel and beyond. Your Name Do you think this blog has what it takes to be listed at the top of Expats in Israel Blogs?